Fazio F, Faggio C, Marafioti S, Torre A, Sanfilippo M, et al. (2013) Effect of water quality on hematological and biochemical parameters of Gobius niger caught in Faro lake (Sicily). 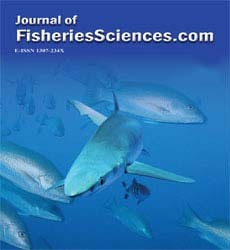 Iranian Journal of Fisheries Sciences 12: 219-231. YAPICI S, FILIZ H, OZKAN O (2012) Age, growth, reproduction and feeding habits of brown comber, Serranus hepatus (L., 1758) in eastern Aegean Sea. Biharean Biologist 6: 99-107. Hajji F, Ouannes-Ghorbel A, Ghorbel M, Jarboui O (2012) Reproductive biology of the rock goby, Gobius paganellus(Actinopterygii: Perciformes: Gobiidae), on the southern Tunisian coast(Gulf of Gabes). Ciencias Marinas 38: 505-515. Hajji F, Ouannes-Ghorbel A, Ghorbel M, Jarboui O (2013) Reproductive biology of the black goby, Gobius niger (Teleostei: Gobiidae), in the Gulf of Gabes (Tunisia, Central Mediterranean). Journal of the Marine Biological Association of the United Kingdom 93: 1685-1693. Pompei L, Giannetto D, Lorenzoni M Age and growth of Arno goby, Padogobius nigricans (Canestrini, 1867), in the Aggia River (Umbria, Central Italy). Journal of Applied Ichthyology 31: 494-500. Pompei L, Giannetto D, Lorenzoni M (2016) First information on age and growth of Padogobius bonelli (Bonaparte, 1846) outside of its native range: River Aggia (Central Italy). Knowledge and Management of Aquatic Ecosystems 417: 26. Araújo R, Wirtz P. BOCAGIANA. Boban J, IsajloviÄ I, Zorica B, KeÄ VÄ, VrgoÄ N, et al. (2013) Biometry and distribution of the black goby Gobius niger (Linnaeus, 1758) in the Adriatic Sea. Acta Adriatica 54: 265-272. KasapoÄlu N. Age, growth and mortality rates of discard species (Uranoscopus scaber, Neogobius melanostomus and Gobius niger) in the Black Sea Karadeniz’de Ä±skarta türlerin (Uranoscopus scaber, Neogobius melanostomus ve Gobius niger) yaÅ, büyüme ve ölüm oranlarÄ±. Scope of the Journal 35: 397. Filiz H. AGE, GROWTH AND FEEDING OF THE BLACK GOBY, GOBIUS NIGER, IN CANDARLI BAY (AEGEAN SEA). Hajji F, Ouannes-Ghorbel A, Ghorbel M, Jarboui O (2012) Biología reproductiva del gobio de roca, Gobius paganellus (Actinopterygii: Perciformes: Gobiidae), en la costa del sur de Túnez (golfo de Gabes). Ciencias marinas 38: 505-515. KasapoÄlu N. Karadeniz’de Ä±skarta türlerin (Uranoscopus scaber, Neogobius melanostomus ve Gobius niger) yaÅ, büyüme ve ölüm oranlarÄ±. EmiroÄlu OS. Alien fish species in upper Sakarya River and their distribution. African Journal of Biotechnology 10: 16674-16681. Szczepkowski M (2009) Impact of selected abiotic and biotic factors on the results of rearing juvenile stages of northern pike Esox lucius L. in recirculating systems. Archives of Polish Fisheries 17: 107-147. Zakêœ Z, Szczepkowski M, Demska-Zakêœ K, Jesio³owski M (2007) Oxygen consumption and ammonia excretion by juvenile pike, Esox lucius L. Arch. Pol. Fish 15: 79-92. Benzer S, Gül A, Yilmaz M (2010) Breeding properties of Esox lucius (L., 1758) living in Kapulukaya Dam Lake (Kirikkale, Turkey). African Journal of Biotechnology 9. Å»arski D, Rechulicz J, Krejszeff S, Czarkowski TK, StaÅczak K, et al. (2013) Ovarian alterations in wild northern pike Esox lucius females. Diseases of aquatic organisms 106: 49-56. Å½iliukienÄ V, Å½iliukas V (2012) Spawning population characteristics of pike Esox lucius L. in Lake Rubikiai (Lithuania). Central European Journal of Biology 7: 867-877. Payal A. Impact of pollution on water quality and fishes of river Tawi. Moslemi-Aqdam M, Namin JI, Sattari M, Abdolmalaki S, Bani A, et al. (2016) REPRODUCTIVE CHARACTERISTICS OF NORTHERN PIKE, ESOX LUCIUS (ACTINOPTERYGII: ESOCIFORMES: ESOCIDAE), IN THE ANZALI WETLAND, SOUTHWEST CASPIAN SEA. Acta Ichthyologica et Piscatoria 46: 313.